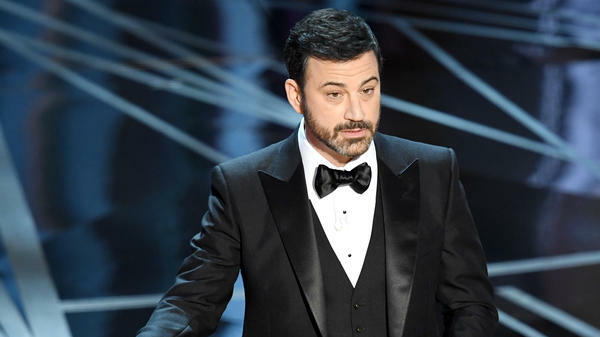 Host Jimmy Kimmel during his opening monologue at the 89th Annual Academy Awards. 12:36 a.m.: It's naive to suggest that we're done with this year's Oscars coverage, because we'll be talking about this one for a looooooong time. But to recap, for now: Moonlight is your best picture, and is absolutely wonderful, and will hopefully be seen by a lot more people as a result. (It also took best adapted screenplay and best supporting actor.) La La Land leads the field with six Oscars — including best director and best actress — out of 14 nominations. Manchester By The Sea takes best original screenplay and best actor. 12:25 a.m.: Poor Jordan Horowitz, one of La La Land's producers, had to break the news in the middle of a celebration — and held up the card to the cameras so everyone knew he wasn't kidding. Then, he handed off the award to Moonlight in the most gracious possible way. 12:19 a.m.: We're going to be parsing this one for a while, because Faye Dunaway and Warren Beatty said "La La Land," and the La La Land folks started giving their speeches, and then they looked at the card, which read, "Moonlight." At which point they called up the Moonlight people, who came up to accept. Never seen anything like it, and at the highest-profile possible time, too. 12:14 a.m.: And now, to hastily rewrite history, because: BEDLAM. The wrong winner was read, and Moonlight is your Best Picture. Also, Thomas E. Dewey is our 35th president. 12:09 a.m.: And your winner, at long last, is La La Land. Won't mute the backlash a whole lot, but once you've won Best Picture, backlash is kinda beside the point, right? 12:05 a.m.: On the 50th anniversary of Bonnie & Clyde, Faye Dunaway and Warren Beatty give out the final award of the evening: Best Picture. Our nominees, one last time: Arrival, Fences, Hacksaw Ridge, Hell Or High Water, Hidden Figures, La La Land, Lion, Manchester By The Sea and Moonlight. 12:02 a.m.: In a minor surprise, given some of the padding in the telecast's midsection, it looks like we're only going to come in a few minutes late. Best Picture is next, and looks like a lock for... well, let's just see. 11:57 p.m.: After a characteristically dry Affleck speech, we zoom right into the Best Actress prize, which — to the surprise of absolutely no one — is transported directly into the hands of one Emma Stone. 11:51 p.m.: After pantsing around all night, we're finally barreling through the big ones. Best Actor has been considered a close race between Casey Affleck and Denzel Washington, with Washington appearing to have momentum. But... it's Affleck. 11:44 p.m.: Damien Chazelle wins Best Director for La La Land — not a huge surprise, and probably (but not certainly) a bellwether for Best Picture. At 32, he's the youngest person ever to win the award. 11:30 p.m.: After the umpteenth Matt Damon bit, we are at Best Original Screenplay. Sure would be a shame to wrap this baby up in less than four hours. And your Best Original Screenplay winner is... Manchester By The Sea! And not La La Land! And apparently Glen Weldon was right! 11:24 p.m.: For the In Memoriam segment, the Oscars' directors have wisely muted the crowd, thus sparing the world the unseemly business where big stars get applause and lesser-known figures don't. In other news, wow, a lot of terrific folks have died in the last year. 11:20 p.m.: La La Land continues to gain momentum, this time winning Best Original Song for "City Of Stars." Lin-Manuel Miranda, for now, misses out on EGOT status, and must for now remain an EGT. 11:15 p.m.: La La Land wins best original score. 11:05 p.m.: John Legend performs "City of Stars" and "Audition (The Fools Who Dream)," the two songs from La La Land nominated for best original song. Both songs are composed by Justin Hurwitz. 11:02 p.m.: Celebrities read mean tweets about themselves, a gag you might have seen on YouTube or Jimmy Kimmel Live! 11:00 p.m.: La La Land wins for best cinematography. I predict you'll see more wins for La La Land later tonight. Can we talk money for a moment. The Academy Awards aren't technically about dollars, but within the industry, they're kinda about dollars. The nine films that received Oscar nominations for best picture had taken in $483 million prior to the nominations. That Oscar bounce is why film studios spend millions of dollars chasing nominations, and it's just the tip of the proverbial (though gradually melting) economic iceberg. Ancillary income for Oscar nominees is also substantially improved — home video, DVDs, and TV and cable sales. And winners? In the major categories, a win is career-changing. Directors of Best Pics, stars who win major awards, all have expanded opportunities, higher paydays, more roles that could lead to, well. Oscar consideration. 10:52 p.m.: John Cho and Leslie Mann do a bit about the scientific and technical awards. 10:50 p.m.: Sing wins for short film, live action. 10:44 p.m.: The White Helmets wins best documentary short. NPR's Mandalit del Barco profiled the film for All Things Considered. 10:36 p.m.: Hacksaw Ridge wins best film editing. For those keeping score at home, the film has picked up two awards. 10:33 p.m.: Actor and writer Seth Rogan salutes his childhood favorite film Back to the Future, then enters via a DeLorean with beloved actor Michael J. Fox. 10:30 p.m.: The Jungle Book takes the Oscar for best visual effects. The Pop Culture Happy Hour crew thinks this category was stacked, so this is a deserved win. 10:28 p.m.: And now... A SALUTE TO THE MOVIES!!! 10:20 p.m.: Two things can be equally true. 1. These tour bus people are cute. 2. This bit has been going on since the Industrial Revolution. 10:16 p.m.: Kimmel does a bit, pranking a tour bus who don't realize they're at the Oscars. Gary and Vicki from Chicago get fake-married by the power invested in Denzel by the state of celebrity. 10:14 p.m.: Best production design goes to La La Land, its first win of the night. Won't be the last. 10:11 p.m.: Best animated feature goes to Zootopia. Not a surprise, but Kubo and the Two Strings is a gorgeous and surprising film that not enough people saw. FYI. 10:08 p.m.: Best animated short goes to Piper, the Pixar short. 10:04 p.m.: Sting performs "The Empty Chair" from the documentary Jim: The James Foley Story. Seems like he could keep playing for hours and hours and hours without ever reaching the song's climax. 9:58 p.m.: The Salesman of Iran wins best foreign language film; director Asghar Farhadi is absent, "out of respect" for residents of Iran and other nations targeted by the Trump administration's travel ban. 9:55 p.m.: The theme for the evening, Kimmel informs us, is "Inspiration." As opposed to, you know: "Handing out awards." 9:50 p.m.: Glen here, noting that 1. Foreign language film is coming up next, and 2. My Oscar predictions, as of this moment, stand at 50%. I'm a coin toss! 9:44 p.m.: Mark Rylance and his jaunty hat give out Best Supporting Actress — which to the surprise of no one on earth, goes to Viola Davis, who could have just as easily been nominated (and won) for Fences. 9:38 p.m.: A montage honors Governors Awards winners Lynn Stalmaster, Frederick Wiseman, Anne V. Coates and Jackie Chan, who hasn't aged a day in decades. 9:36 p.m.: A Weekend Edition Sunday piece on Kevin O'Connell, who just won his first Oscar in 21 tries. 9:33 p.m.: Six awards in, and six different movies have won so far: Moonlight, Suicide Squad, Fantastic Beasts And Where To Find Them, O.J. : Made In America, Arrival, and Hacksaw Ridge. More than an hour into the ceremony, La La Land has gone 0-for-3. 9:30 p.m.: Best sound mixing, in a bit of an upset, goes to Hacksaw Ridge — including Kevin O'Connell, winning his first Oscar in 21 tries. 9:28 p.m.: Best sound editing goes to Arrival, giving La La Land its second loss of the night. So, if you're keeping score, that's "Suicide Squad 1, La La Land 0." Also, Arrival is wonderful. 9:25 p.m.: If you had "9:25" for the first utterance of "the magic of the movies," you're a winner! 9:24 p.m.: Stephen here, to note that the Oscar crowd looks much more excited to see Cheryl Boone Isaacs than the Grammy crowd will ever be to see Neil Portnow. 9:15 p.m.: Best documentary feature goes to the 467-minute OJ: Made in America. It's the longest film to win an Academy Award. As you'd imagine. 9:01 p.m.: Best Costume Design goes to Fantastic Beasts and Where to Find Them. This is La La Land's first loss of the evening. 8:58 p.m.: Best Makeup and Hairstyling goes to Suicide Squad. Glen Weldon audibly gasps. 8:55 p.m.: Glen Weldon notes that as of this moment his predictions are at 100%. 8:51 p.m.: Costume design coming up next. 8:50 p.m.: Not a surprise, but a nice emotional speech. "We are servants to these characters, these stories." 8:47 p.m.: First award: Best supporting actor, Mahershala Ali for Moonlight. 8:45 p.m.: Looks like we're going to get a bunch of montages tonight, retrospectives of past winners for each category. 8:44 p.m.: Number of jokes about nobody seeing the nominated films: 3. And counting. 8:40 p.m.: First laugh of the evening, in re: the movies of 2016. "Black people saved NASA, and white people saved jazz." 8:37 p.m.: Who had seven minutes in the "Kimmel does a Damon bit" pool? 8:35 p.m.: We begin with Justin Timberlake performing "Can't Stop This Feeling" while dancing at rows and rows of awkward Hollywood types. Not so much audience participation as audience toleration. 8:20 p.m.: The show's about to start. As host of big events like this, Kimmel's got a history of keeping things moving at a brisk trot and dialing down the "HOLLYWOOD'S MOST GLAMOROUS NIGHT OF STARS! DREAMS MADE OF FLICKERING LIGHT! "-iness of it all. Which makes for better TV. He also has a history of dragging Matt Damon onstage for a bit that your Uncle Hank will likely find hilarious. With so many tech awards up front, it'll take a while for a La La Land sweep — if it happens — to register. 6:15 p.m.: Welcome! We're here at NPR HQ at The Hub — the circle of monitors around which NPR editors gather when breaking news occurs. Big decisions that shape NPR coverage are made here. ... We're, um, watching the watching the red carpet. All of us at Pop Culture Happy Hour (host Linda Holmes, panelists Stephen Thompson and Glen Weldon, frequent fourth chair Bob Mondello, and producer Jessica Reedy) are gearing up for the 89th Annual Academy Awards. We're trying on gowns, experimenting with up-dos, and wondering if our 39-carat lavalier necklace steals focus from our Nirav Modi earrings. We'll be live-blogging all night long, beginning with the red carpet at 6:00 pm Eastern Time, and continuing until the ceremony ends, or the heat-death of the universe, whichever comes first. Keep refreshing this page to stay up-to-date on our coverage/commentary. Will La La Land sweep? Will Moonlight wax or wane? Will Suicide Squad win its hair-and-makeup category, and thus cause the phrase "the Oscar-winning Suicide Squad" to be loosed upon an unsuspecting world, creating a rift in spacetime?